Gold Cup Winner With Soccer Ball Success PowerPoint Templates And PowerPoint Themes 1012-"Microsoft Powerpoint Templates and Background with gold cup winner with soccer ball" -Gold Cup Winner With Soccer Ball Success PowerPoint Templates And PowerPoint Themes 1012-This PowerPoint template can be used for presentations relating to-"Gold cup winner with soccer ball, competition, sports, success, leadership, business" Our Gold Cup Winner With Soccer Ball Success PowerPoint Templates And PowerPoint Themes 1012 are empowering agents. Your thoughts will create the correct chemistry. 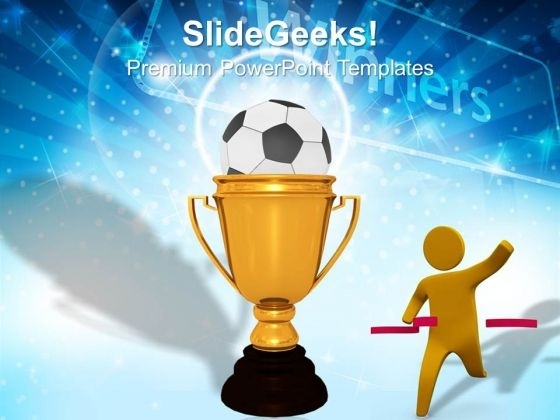 Impress a church with our Gold Cup Winner With Soccer Ball Success PowerPoint Templates And PowerPoint Themes 1012. Just download, type and present.